Spring is shearing time, oh and fall too….. Depending on the type of fiber critters you have, you will always shear in the spring and some critters will be shorn in the fall as well. Here at BlackWater Treasures spring shearing is for everyone, ALL the Sheep, the Alpaca fiber boys and the Angora Goats, too. We shear in early April before the weather gets hot and before the ewes start giving birth. Fall shearing is usually the first weekend of October. Included in the fall line-up is our mohair fiber boys and all the Icelandic sheep. Typically for Icelandic sheep, the fall fleece is the best and of course all the lambs first shearing are the softest most wonderful fleeces to work with. 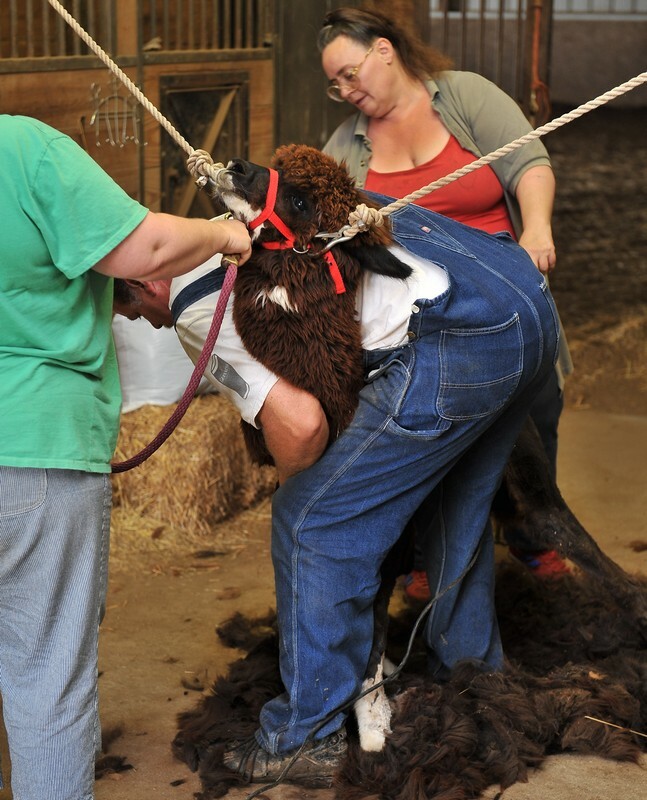 So for your viewing delight, here are pictures of both sheep and alpaca shearing. Sheep and Goats are shorn by placing them on their bottoms at the shearers feet. One of the secrets of successful shearing is being able to hold and move the sheep in such a way that it remains relaxed. So the shearer must be comfortable and balanced during shearing. The sheep are gathered up and held in a pen while waiting to be shorn. Danny Smith our friend and professional shearer starts with the white sheep and progress through the colors ending in black. 1) Danny starts with the belly and inside legs, all this wool is discarded. 2) Next he shears the center of neck from the chin down, going around the neck and starts down the left shoulder. 3) He works in long strokes over the left side all the way to the backbone ending at the britch/rump area. 4) Next he trims up the face and head. 5) Then he starts back at the neck this time going to the right. 6) And last he works in long strokes over the right side all the way to the backbone ending at the britch/rump area. Alpacas are usually shorn on the ground. The process only takes 5 -10 minutes from the time they are put down until they are back on their feet. There really in not much stress involved for the paca, but for the people it is strenuous on the back, legs and knees. It is worth it, because after you are done you have a much cooler alpaca and a bag full of paca fluff to play with. Alpacas on a Shearing Table. Alpacas can also be shorn on a shearing table. I like this method the best. It is easier on the humans and is more secure for the alpacas. Lead the alpaca to the front of the table (person #1). Put the belly strap under him and hold it securely(person #2). 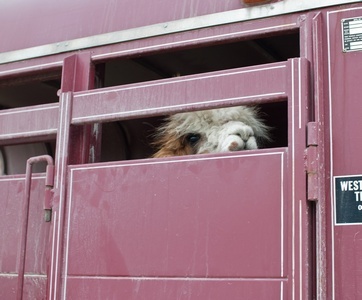 Person #1 walks behind the table with the lead rope to hold the alpaca's head steady. 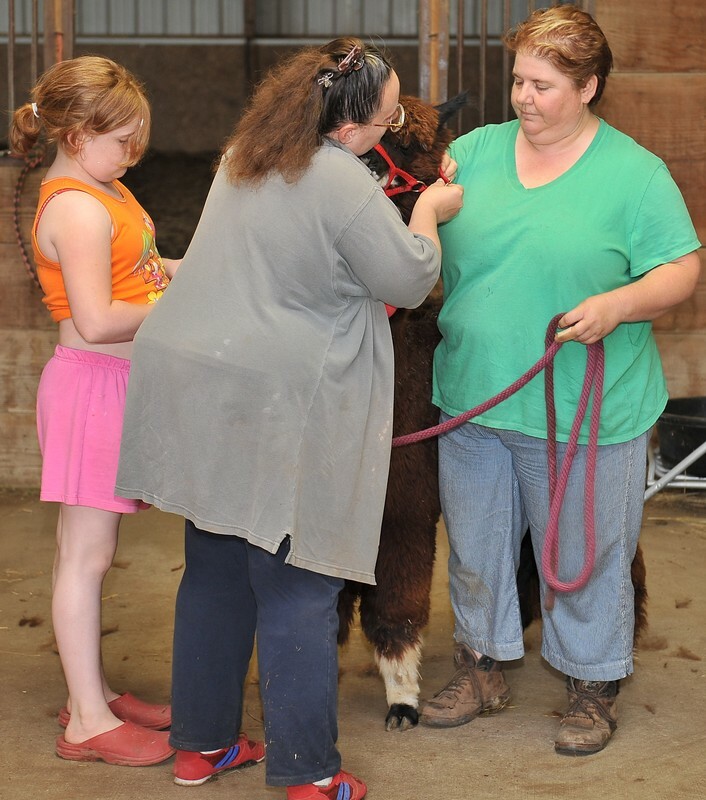 Person #3 gets ready to grab the alpaca's front legs. 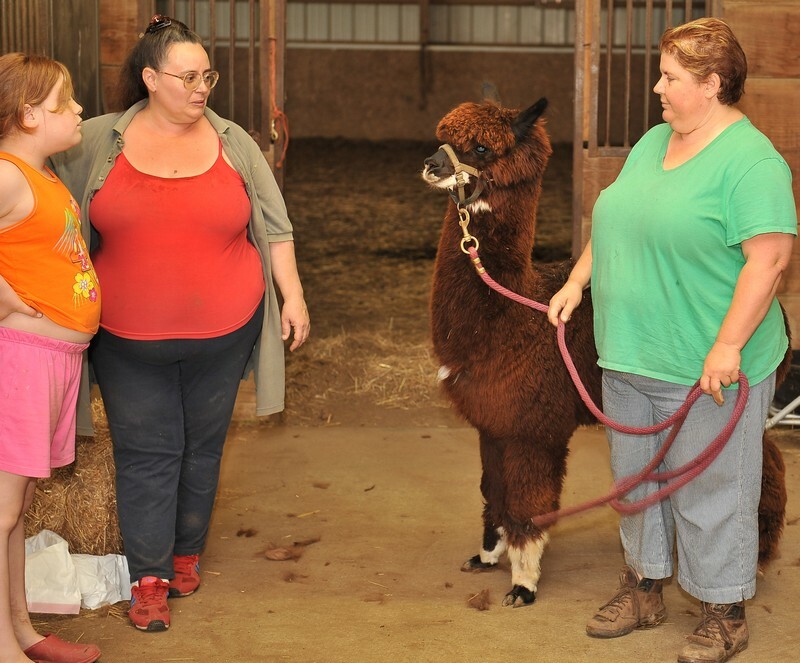 Person #4 gets ready to grab the alpaca's back legs. Person #2 tilts the table to the flat position while persons #3 and #4 secure his legs as they help lift and steady him on the table. 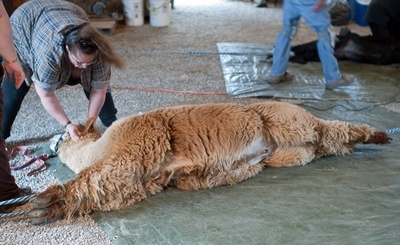 Shearing commences with the blanket, the neck, the chest, the belly, the britch and the legs. 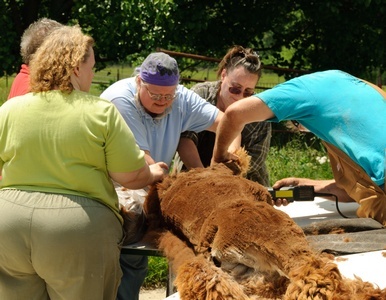 Shearing continues with the blanket, the neck, the chest, the belly, the britch and the legs. All the fiber is gathered up and put into marked bags as the alpaca is sheared. 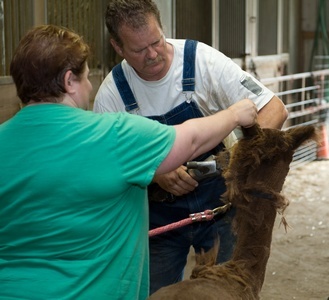 The alpaca's head is trimmed up last, his annual shots are given and his feet and teeth are trimmed if needed. One year, we sheared some of our younger Alpaca boys standing up. This was fairly successful, with only a few of them going kind of nutsy. I really was not too pleased when the fiber fell to the ground, because as much as we swept and tried to keep them in the middle of the alley, the fleece knew where the straw was and flew straight to it! 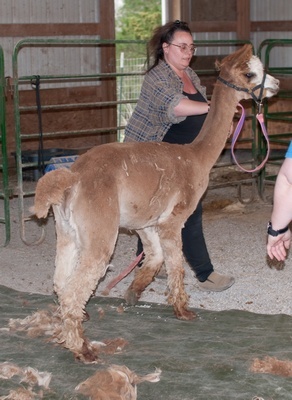 I would only recommend this type of shearing if the alpacas are tame and easy to handle. The wild ones jump around too much and your fleece can be in danger of being stomped on and disassembled. Our Studio - back to the beginning. Choosing a Quality Fleece - where we learn how to get the best fleece. Cleaning Fiber - where we learn the all about washing fleeces. Preparing Fiber to Use - where we learn how to card and comb.